Roland Corporation was founded by Ikutaro Kakehashi on April 18, 1972. He started Roland Corp. from another company he had founded nearly 10 years before, Ace Electronic Industries Inc. (or simply Acetone), which had the electronic organs and the drum machines as its main products. The first instruments manufactured by Roland were drum machines too, but yet in the first year of existence the company launched its first synthesizer (SH-1000) and its first electronic piano (EP-10). 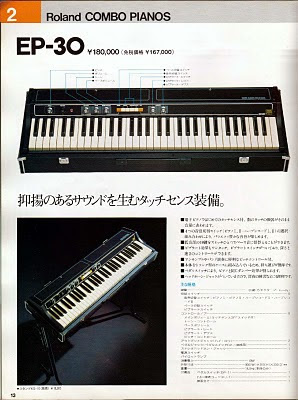 In the following year, 1974, appeared the first electronic piano with touch-sensitive keys in the world: Roland EP-30. The Roland EP-30 has a fully polyphonic keyboard with 5 octaves (from F to F) and four different voices, two pianos and two harpsichords. A bass sound also can be switched-on in the first octave and a half. A vibrato effect (with individual controls of rate and depth) can be added to the presets. A knob for adjusting the pitch is also present in front of the EP-30. The sensitivity of the keys can be removed by the volume knob, pulling it out. Unlike a Rhodes electric piano or a Wurlitzer "electronic" piano or even a Hohner Pianet, the EP-30 is fully electronic, without real mechanical action (only electronically simulated) and its keys do not have the same weight of the piano keys. Its sound is generated from fixed frequency oscillators. Even being a fully electronic piano (not a electric one), the chassis itself is the suitcase of the instrument and a wooden cover was part of the instrument, following the tendency of almost every electric/electronic piano of its time. A steel basis to support sheet music scores was provided to attach on the top of the piano. The connectors on the rear of the piano are very simple, being a jack for sustain pedal and other two for audio output (low and high impedance, for headphones). This instrument has a sort of drawer on the bottom that serves to keep the power cable safe when the instrument is off. It's a very useful and interesting detail that should have continued to be done, both in the Roland instruments as on the other manufacturers! I bought my Roland EP-30 in July 2009 from a friend who repairs analog instruments in São Paulo. It - the piano, obviously - is in excellent condition, except of some rust on the chassis. All knobs are originals from the factory and I bought it with the wooden cover and the original basis for sheet music included! The serial number of my EP-30 is 311.410 and no change or adaptation were made. It is a rare instrument - I don't know any other, at least in Brasil - so I didn't find much information on it, so I have no name of musicians or bands who had used this electronic piano. I recorded this video on March 2, 2011! I found the User Manual (in Japanese) on the internet and here is the link!